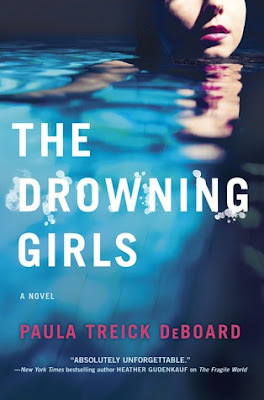 Paula Treick DeBoard, an American best-selling author, pens a mystifying tale set in a modern, posh American neighborhood which haunts a new family by the buried lies and secrets behind the doors of their neighbors, in her upcoming book, The Drowning Girls. This story revolves around a family who just shifted to a nice and rich neighborhood but their happy days soon turn into nightmare by a fifteen year old girl whose plans for the summer is way too sinister. But while Kelsey quickly becomes a fixture in the McGinnis home, Liz's relationships with both Danielle and Phil grow strained. Now even her own family seems to be hiding things, and it's not long before their dream of living the high life quickly spirals out of control. Liz, Danielle and Phil McGinnis shifts to The Palms- a posh American neighborhood in the summers and as Phil lands a job in the club house of The Palms, he and his wife, Liz and his step-daughter, Danielle gets to live amongst the rich urban people for free in an equally lavish house. But their blissful summers are not so blissful when their neighbor's teenage daughter, Kelsey becomes friend with Danielle and starts hanging out in the house as well as in their pool. It becomes a living hell when Kelsey's agenda behind the good nature is surfaced. But the neighbors don't do anything in return to help the McGinnises, instead they lie on their faces and turn their backs on them and even accusing them. What lies buried under such a lavish neighborhood is for you to find out! Firstly lets just say that the author's writing style is not only eloquent but is laced with suspicion that will keep the readers from turning the pages of the book with their minds forced to question each and every doubt which quite unpredictable. The story opens in the month of June 2015 with Liz waking up to the screaming of the girls coming from the pool and when she rushes there, she finds out that Kelsey's lifeless body is floating in the pool with her daughter Danielle and her friend, Hannah, screaming at the top of their voices. From then on the story jumps back to June, 2014 when they first shifted to The Palms. Hence the story swings from present to the past and the past is highlighted with both Phil and Liz's POV. The mystery of Kelsey's death in 2015 only deepens with her tantrums from the summer of 2014. The narrative of every other character in this book is engaging and free-flowing. The pacing of the book is really fast and the mystery has so many twists and turns and if the readers try to predict on their own, they will be thrown off the edge with a shocking revelation here and there. The mystery is unraveling and it will keep the readers anticipating till the very last page and with an equally riveting climax that is sooo hard to foretell, the book is one hell of a tantalizing read. The mystery is bone-chilling and at times, will give the readers goose bumps. The author has a strong psychological grip on the characters which are realistic and laced with their weaknesses and flaws. The main character, Liz and Phil, are quite well-developed. Their individual POV is articulate and will also give enough space to look into the story from the readers' own POV. Liz tries to be the perfect mother who works as a high school student counselor. When they shifts to The Palms, Liz is filled with doubt on whether she will be able to mix up with the post neighbors. Moreover, Liz is bit controlling, yet she at times could not see certain problems to their depths. Phil, on the other hand, will give the readers a feeling like he is funny, caring and easy-going but trust me, the whole mystery depends on Phil's POV. Liz's relationship with both her husband and daughter is reflected with so much realism. Kelsey is another character, who is an attention seeker and considering her tender age, her mind works like a 30 year old woman, filled with twisted and dark ideas. Danielle is the nerdy teenager who is brave, smart and strong even when she is cyber-bullied. In short, this is yet another beguiling read for me in this year, the mystery is perfect with an equally dark and twisted story. I will request all the parents with teenage daughters to read this compelling thriller. And in general, I would ask every other mystery lovers to not to miss this gripping story. Verdict: Definitely a must-read psychological thriller. Courtesy: I was lucky enough to receive an ARC from the author. So thank you Paula Treick DeBoard for giving me an opportunity to read and review this book.